provide nutritious food to hungry people statewide in a manner that respects their dignity, while fighting to eliminate hunger. [Their] vision is ample nutritious food is available to everyone in Washington State. Northwest Harvest relies on donations and volunteers. I got involved through the Rotary Club of Sammamish, and there were large groups from many local Rotary clubs there yesterday, as there are many weekends. You can bring your group too! Or contact me and join us the next day we go. You can help; it makes an immediate and powerful difference in people's lives. It's a great activity to do with your kids too. 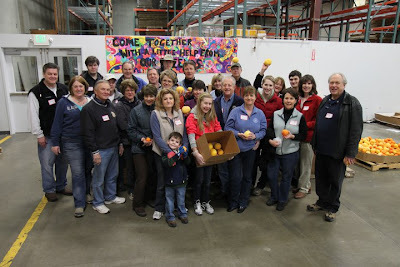 Here is the team from the Rotary Club of Sammamish—Rotarians and friends!